Sabz arhar dal or sabzi wali arhar dal is super nutritious as well as tasty. It's a combination of taste and health. This recipe of arhar dal contains proteins from dal and goodness of vegetables. I find it so delicious that I just can't stop at 1 bowl. I have to reach for second helping. You can add any number of vegetables you have in your fridge and as per your taste. 1. Wash and soak arhar dal for 20 minutes, drain. 2. 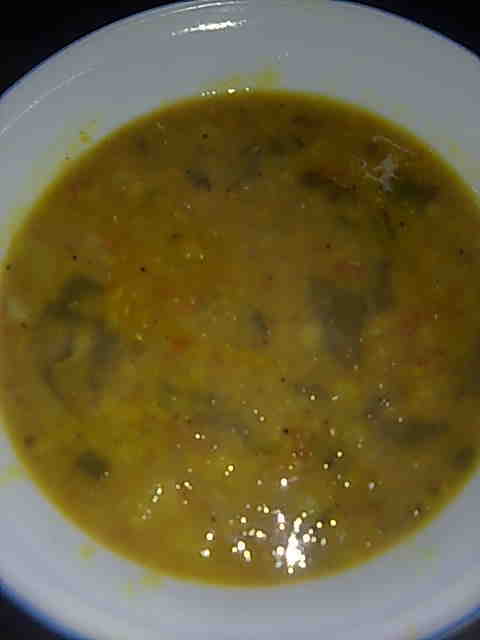 In a pressure cooker, place arhar dal, vegetables, garlic, salt, turmeric and red chilli powder. Add enough water and let 1 whistle come. Turn the heat to medium and pressure cook to 4 more whistles. 3. Let the pressure drop down naturally before opening the lid. 4. In a small pan, heat ghee. Add rai and when it splutters, add hing. Let it fry for 1 second. Turn off the heat. Pour this tadka or tempering over the boiled dal and mix. Serve hot sabz arhar dal with boiled rice or roti.